"Before We Forget" is a mixed media piece by Elsha Bohnert that includes this writing: "What I want is for the men working on the roof to burst out singing and the dogs and neighbors to join in. Time runs thin as silk. We may come back without a voice, frightened, in a hurry, never safe in our bed. Better feast on chocolate. Now, kiss, open all windows, sing out the names of those we love, the dead and what has died, when we forget to count our blessings." The work is part of the "Replay: Recycled Work by 7 Hawaii Artists" exhibit at the Sub-Zero/Wolf Showroom, on display through Oct. 13. An exhibit currently on display at the Sub-Zero/Wolf Showroom mixes recycled artwork and humor with stellar results, in "Replay: Recycled Work by 7 Hawaii Artists." The show continues through Oct. 13. The seven include Ira Ono, dubbed by showroom art director David Behlke as "the king of recycled art," Elsha Bohnert, Rebecca Horne, Alan Leitner, Mark Maresca, Bernie Moriaz and Lori Uyehara. 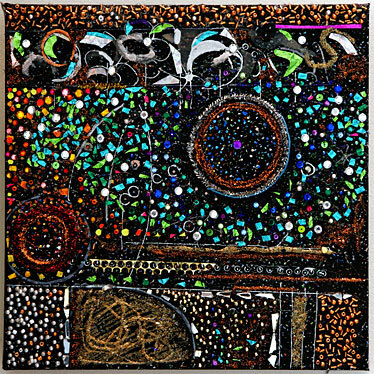 Leitner recycles old wax and powdered pigment on new canvases, while Ono contributes pieces that "are probably some of his best artwork ever," says Behlke. 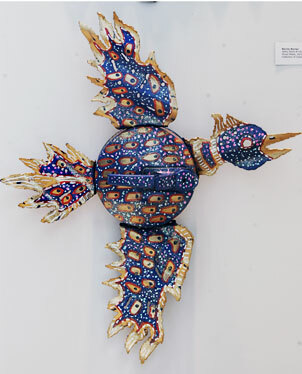 Moriaz's works are whimsical, a "feast for the eyes," Behlke says, and he calls Uyehara's style "elegant" and "completely unique -- there's nothing derivative about her work." 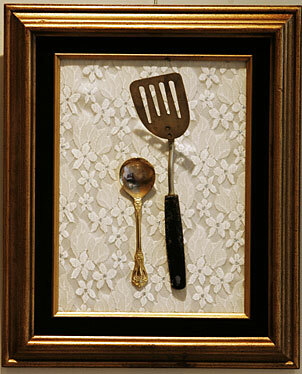 Horne's creative pieces utilizing kitchen utensils shows off her great sense of humor, and Maresca, a new artist, submits sparkly works made with glitter, sequins, beads and the like. Bohnert is what Behlke refers to as a "naturopathic artist"; her works express a belief in healing through nutrition and exercise. The Sub-Zero/Wolfe Showroom, located at the corner of Piikoi and King streets, is open 10 a.m. to 6 p.m. Tuesdays to Saturdays. Call 597-1647. Bernie Moriaz made "T-Bird" out of an old tea kettle. "Shimmer," a glittery piece by Mark Maresca, is made with sand, gold and silver pipe cleaner, glitter, sequins and beads. 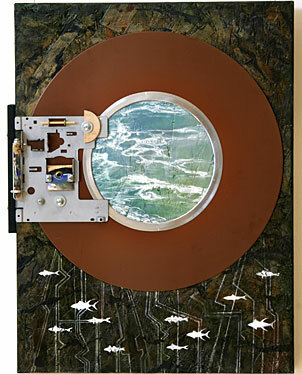 A mixed media piece by Lori Uyehara titled "Containment Field: Sea." Rebecca Horne mixes old kitchen utensils and a great sense of humor for her piece, "Sarah Jane's Wedding Portrait (She Married Beneath Her)."